I may be an immigrant, but I’ve passed my ‘Life in the UK’ test and I understand that people in this country can vote from the age of eighteen. But what’s really winding me up in this election is that you wouldn’t bloody well know it from the way the media behaves. So, with apologies to those who flock to this blog for my considered views on higher education, I’m going to have a media-studies rant. I figure the BBC – though they’re not alone in this – has a view of a voter as being about sixty. And given the powerful data on age as an influence on voting intention, which suggests that age now has more influence on choice than class, I reckon this is distorting their professedly unbiased representation of the election. Journalists apparently love going out into the big wide world to gather the views of ‘the public’. Actually, I think they really hate it, which may be part of the problem, but the model is predictable and occasionally illuminating. But I swear – and maybe I’ve missed things, but I’ve been stuck at home for the past two weeks after an operation, getting bored and listening to lots of news programmes, and I really mean that I’d swear to this – every time I’ve heard a BBC radio journalist doing this in the course of the current election campaign they’ve spoken only to people over the age of about fifty. Now I accept that it might be easier to find huddles of older folk in the daytime; I accept also that it can be catchy to have someone saying ‘I’ve always voted X, but I’m buggered if I’m going to do that this time’; and I also accept that the average journalist might feel more comfortable approaching a sixty-year-old than a nineteen-year-old. But it’s unrepresentative and it’s crap. Every time we get the nice retired chap saying that Theresa May will be strong and stable, without a student chipping in with an opposing view, we’re actually getting an insidious little bit of bias. I’d also bet that if I asked one of these journalists to visit a university campus, I’d be told that they know what the majority of students will say, so it would be unrepresentative to do so. Well, frankly, on that I’d rest my case. See you at the bowls’ club. 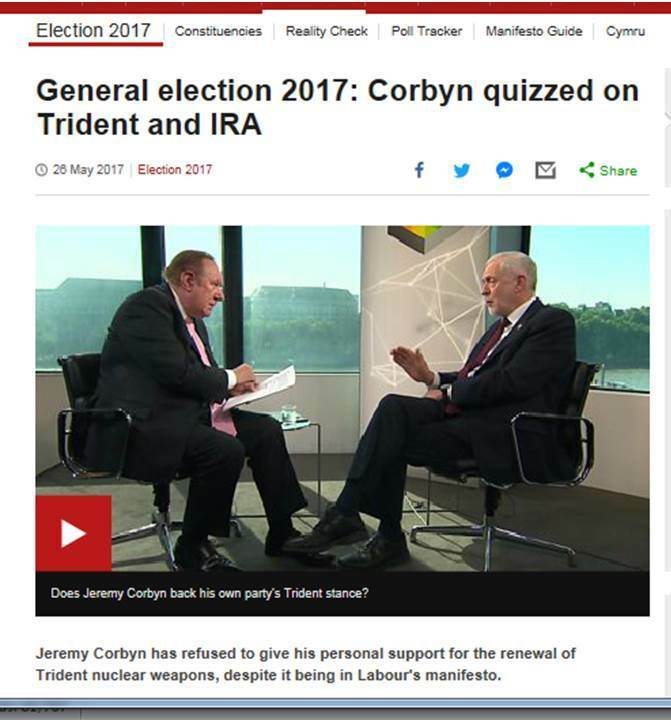 How much of his interview with Jeremy Corbyn did Andrew Neil devote to the IRA? Ten minutes? Eight minutes? Five minutes? Honestly, I couldn’t bear to drag myself back to it in order to check. And if it wasn’t the IRA it was other historic conflicts. I wouldn’t argue for a minute that this isn’t relevant, nor would I argue that Corbyn’s political backstory isn’t an issue in this election. I’m one of those people who blew £5 by becoming a Labour ‘supporter’ last year in order to vote for Owen Smith. But is it really all that important as we look forward to the next five years? I mean, there are millions of voters who can’t remember The Troubles. Maybe they need to learn their history, but perhaps most of all right now they’re worrying about the future. These are the people who voted overwhelmingly against Brexit, and whose lives are going to most affected by it, for decades to come. But Brexit, Andrew Neil? I think he mentioned it once in that interview. The unmade costings of Brexit render all other calculations in this election pretty much meaningless. We’re living in a fantasy land in which we talk about education, social care and nuclear weapons without anyone questioning just how devastating a hit the economy is about to take. I can’t believe I’m the only one who would rather hear Corbyn’s views on this – and, by the way, that could be the best tactic to expose him, because I don’t think he has any more idea about Brexit than May – than on the IRA. But the wait is becoming a little frustrating. And so the press will turn around in due course and say that younger voters don’t turn out on the day. Frankly, the way they’re represented, who could blame them? In fact, though, this has been exposed as a bit of a myth in relation to the referendum, and I wouldn’t be surprised if younger voters surprise us again this time. I’m not sure any party has the answers they need, but they have every right to be mightily pissed off. Not by way of disputing the thesis (it’s not the BBC and one seventh of even this sample is 62 years old, though that’s clever in context): https://www.theguardian.com/politics/2017/may/27/strangely-optimistic-first-time-voters-8-june .